Heritage model BMW Motorrads are very special machines, and there is perhaps none more special than the 1934 R7. 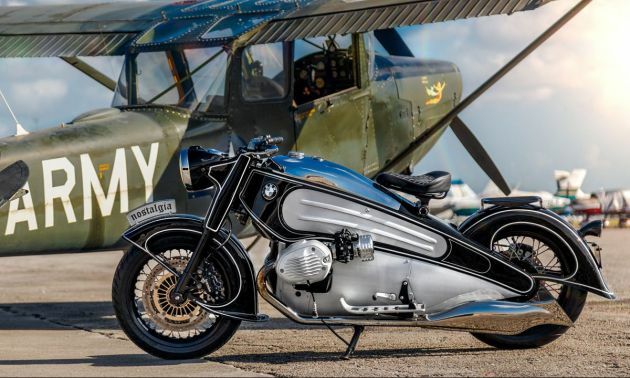 Only one was ever built, then rebuilt by BMW Vintage, and would today cost upwards of 1 million US dollars (RM4.1 million), reports website returnofthecaferacers.com. However, NMoto Studio, based in Florida, US, allows you have a reimagining of the original R7, via a kit based on the BMW Motorrad R nineT. Hand-made by NMoto craftsmen mainly from aluminium, the kit is made up of 74 pieces, including specialist parts from aftermarket suppliers like MotoGadget. Parts are formed on an English wheel as well as CNC machined, and the whole kit actually reduces the weight of the R nineT from the current 222 kg. Needless to say, the NMoto Nostalgia project inspired R7 has a whole lot more go than the original 1934 model, with 110 hp and 116 Nm of torque on tap. At this moment, owners of R nineTs wanting to convert their machines to the Nostalgia Project are out of luck. The Nostalgia Project is only available as a complete build from NMoto with the order book now open for a three to six month delivery window. If you want an R7 look-a-like based on the modern mechanicals of the BMW Motorrad R nineT, NMoto says pricing starts from 49,500 USD (RM205,000) including the cost of a new R nineT with 13 colour schemes on offer. In Malaysia, the 2018 R nineT range of BMW Heritage motorcycles starts from RM82,900.